NIC Components is pleased to announce the addition of NPXH series of X2 class Safety Capacitors to its expanded family of radial leaded (LDD) high performance film capacitors. NPXH series expands upon the established NPX series, with extended capacitance value range from 1000pF to 10uF, and higher operating voltage ratings of 300V, 310V & 330VAC. 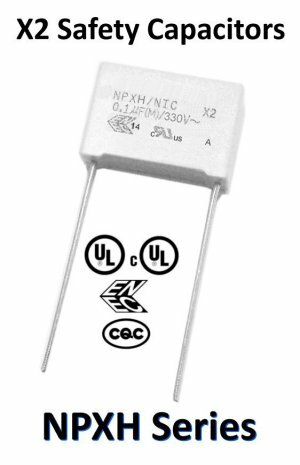 NPXH is intended for use as interference suppression capacitors, used across the AC line and neutral in North America, and L1 to L2 in Europe, to suppress differential-mode interference (EMI). NPXH series utilizes metallized polypropylene film with non-inductive & self-healing wound element construction, for stability under VAC operation, and safe end of life failure mode. NPXH series has safety agency listings with UL, cUL, ENEC, CQC for use in across-the-line, radio interference, and EMI suppression applications. Molded box type construction meets UL-94V-0 flammability test, and is supported in reduced case sizes, for high density circuit designs. NPXH is RoHS compliant, with Pb-Free finish, is supplied in bulk or tape and box (TB) packaging and has unit pricing ranging from $0.05 to $2.49 in production volumes. Contact NIC Components today for free samples or to review your circuit requirements.